Bamboo flooring has been gaining in popularity as it forms a beautiful surface that is stronger than steel and more moisture resistant than traditional hardwoods. As a rapidly-growing grass, bamboo continually produces new shoots which are compressed under extreme heat and pressure to form panels for flooring. Art Z Flooring and Decorating is the Chicago area’s leading provider of flooring installation services and we offer installation of bamboo flooring. Our experienced staff can help you choose a bamboo flooring style that suits your home and budget as well as manage the entire installation process. Bamboo flooring is an environmentally friendly flooring option because the shoots can be harvested using minimal resources and without harming the plant. The shoots from bamboo plants are considered a “rapidly renewable” material because they re-grow harvested shoots within a year that will be ready for harvest in another five and a half years. The root system of the bamboo plant is not harmed during harvesting which allows the plant to continue to live and yield new bamboo shoots. Bamboo shoots are also harvested and removed by hand which eliminates the need for heavy machinery. The quality of bamboo flooring is determined by the care taken during the harvesting and manufacturing process. Bamboo flooring is available in many styles and colors that can resemble the look of hardwood floors or create an entirely unique look. The main distinguishing characteristics between bamboo flooring types include color, style and texture. Natural Finishes: Lighter colors for a blonde appearance. Carbonized Bamboo: Warm, traditional colors that range from light brown to mocha. Dark Stain: Includes a variety of darker, more sophisticated colors. Horizontal Bamboo: This style emphasizes the natural growth rings in the bamboo for an exotic look. Vertical Bamboo: This style contains fewer visible rings and the panels are laid in long slender rows for a tranquil and contemporary look. Strand-Woven Bamboo: The hardest bamboo flooring type and even harder than some hardwood floors; it is ideal for high traffic areas, affordable, and can come in any color. Hand-Scraped: Hand-scraped bamboo floors have a more textured look and the long, wide panels along with the stain and color options allow for many unique looks. Smooth: Texture-free surface with a satin glow. Available in many colors, styles, and textures to create a range of unique looks. 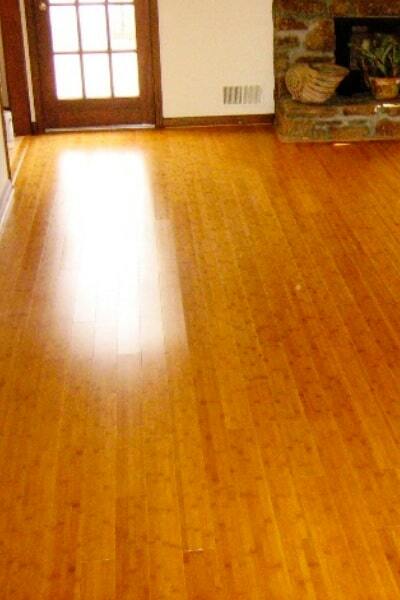 Bamboo is harder than many hardwood flooring types for superior durability. Bamboo is a renewable material which makes it an environmentally friendly option. Can be installed in any area of a home. Regularly vacuum and sweep the floor and make sure to clean up spills immediately. Letting spills and dirt build up will contribute to stains and scratches. Only use area rugs with a non-abrasive backing. Mop with a slightly damp mop only because too much water can cause the floor to warp. Put pads under furniture legs and lift the furniture when moving it across the floor. Limit the direct sunlight hitting the floor with blinds, curtains, or drapes because UV rays will affect the color. Keep the humidity level in your home between 35% and 55% at all times. Do not steam clean or use wax, oil soap, or other household cleaners. The staff of Art Z Flooring are experts in flooring installation and we can install all types of bamboo floors in your home. Each flooring project begins with an inspection of your home and we can also help you choose a bamboo floor that fits with your home’s décor and your budget. We then create a work plan and perform the entire installation using the most advanced tools and procedures. Art Z Flooring and Decorating is a leader in flooring installation in the Chicago area. Contact us to learn more about our bamboo flooring installation services.